From the start Hank, or Carrasca Z, has made me believe dreams are possible. If I can thank this horse for anything, it is for always being there for me and giving me the confidence and support even when I am nervous, worried, or scared. I have had so many firsts with him and last week we walked into the International Arena at the Winter Equestrian Festival (Fla.) to compete in our first 1.40-meter class together and walked out with a respectable 4-fault score. I am a perfectionist, and I never believe anything less than a clear is acceptable, but on this one day I was completely thrilled that we had just jumped around that big class with only one cheap rail and that he jumped the course easy. The day before I kept wrestling with myself, asking if I had made the right decision to show in the 1.40-meter the next day; especially in the international ring with Alan Wade designing. Alan is known for building very nice tracks, but he builds every inch true to size. 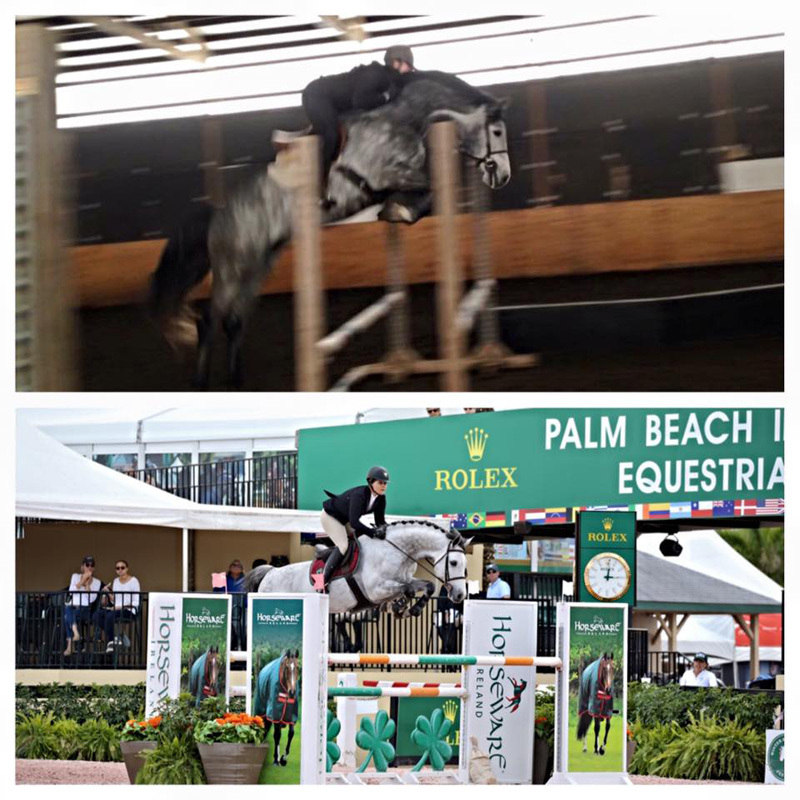 Last fall Joe Fargis and I had a conversation where we discussed that I really wanted to go back to the World Championships for Young Horses and he said that he thought I needed to step up and do some bigger classes at WEF to prepare. At the beginning of last week I talked with him again and he said do the 1.40-meter and see what happens, then drop back down to the 7-year-old developing jumper classes at 1.30-meter. One of the best things I think you can do with young horses, especially when moving them up, is to go up and down in levels to keep their confidence. When you are developing a young horse, I think one of the most important things you need to develop in them is their confidence and bravery. That young horse needs to always believe they can do whatever is asked of them, and the way to make this happen is to ask small challenges of them, without ever putting them in a situation where they are set up to fail. When you challenge a horse, or even a rider, and they accomplish that challenge it gives them a greater sense of achievement and helps them to believe they can do whatever is asked of them. I saw another very good professional this week who is known for bringing along young horses to the grand prix level and he made a very wise comment to me. 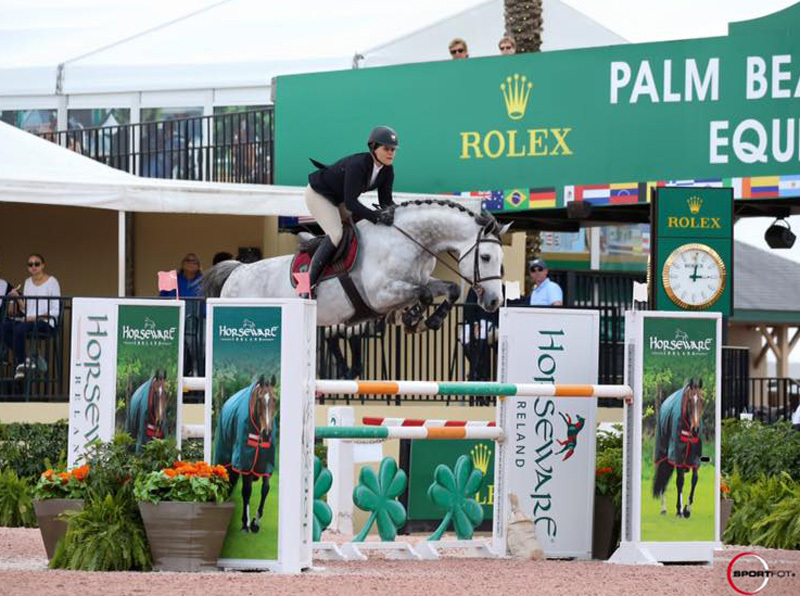 He relayed that one of the hardest times for a young horse is when they make the transition to the grand prix ring because it is so easy to ruin them at that point if you push them or do not pay close attention to how they are feeling. We are definitely not stepping up to the grand prix ring yet, but this was such a great piece of knowledge to think about. So of course, with all of that being said, I was nervous about whether or not I was making the right decision about showing in the 1.40-meter. Hank has done so incredibly much for me and I never want to put him in a situation where he would be uncomfortable. However, I know my horse quite well and he has one of the best brains I have ever seen on a horse and he has been developed to know he could handle that challenge. I also have to clarify this and say that I do not think every 7-year-old that has talent might have been ready to step up and jump that class, and that is where knowing your horse is so very important, because if you push them too quickly it is quite easy to ruin them. On that note, I very much thought he would handle it and handle it well and of course he did not disappoint. When I woke up on Wednesday morning before competing, my memories on Facebook brought up a picture from exactly three years before when Hank jumped under saddle for the first time. It felt like a lifetime ago, but in reality time has flown and I cannot believe that we have already come this far. 2014 on the top, 2017 on the bottom! I was the first one to ever put a saddle on him, the first one to ever sit on him, the first one to jump him under saddle, and to this day no one else has ever really ridden him but me. My sister once trotted him around the ring for five minutes when he was 4 years old so I could watch him trot but that is really it. To me Hank is amazing to ride; he is so much fun to flat because he is so light, adjustable, and supple and to jump he is the same way. He has an uphill canter, is so balanced, and gives you such a good feeling over the jumps. However, with that being said, he is a 7-year-old active breeding stallion and when he is feeling his oats he is feeling his oats, and so everyone at our barn is in unanimous agreement that they don’t ride him, which suits me just fine because I am quite protective of him. Hank got the day off on Thursday, after doing the 1.40-meter class on Wednesday, and then we backed down to the 1.30-meter 7-year-old qualifier on Friday. I think this was necessary for him as a young horse to go in and have a bit easier, very confident round and of course he once again showed me why I am so incredibly lucky to have him. Daniel Coyle, a blazing fast Irish rider, went early in the class and laid down a beautiful, very fast jump-off round 3 seconds faster than the person before him, so I knew our work was cut out for us. Hank jumped and rode so well in the jump-off though and was so slick in his turns that we ended up winning the class by half a second, reminding me why he is the #BestDonkeyEver. While Hank is gorgeous now and everyone remarks on that, when he was a young horse he really needed to grow into himself. He had such big ears on his little body that he earned the nickname, The Donkey, not to be confused with being a donkey. As a young horse he had the best temperament to handle (besides jumping out of the paddocks all of the time until he was 2, thank goodness he stopped doing that); he was so relaxed and willing. When I say that he has given me so much confidence, it is not only under saddle that he has done so. As a stallion, he is one of the best behaved I have ever met, you can collect him one day and ship him next to a mare the next day, to a show where he then goes in and focuses completely on that job. So many stallions can get stallion-like when they are collected regularly and we have been lucky that all of ours are pretty good, but Hank is just that one special one. I never worry when I have to haul him by myself that he will do something stupid, and when we went to Belgium he traveled like a pro. When I presented him at Zangersheide for the Stallion Show in front of the “Breeding Greats,” I was super nervous about going in front of them, but Hank just walked right in there and was his usual perfect self. Luc Tilleman, the owner of Toulon and also a judge at Zangersheide for the stallion approvals, mentioned to my dad later in the week when they were talking that he could see I was super nervous; but I shouldn’t have been because I had Hank. This year I am really hoping that everything comes together and we are able to go back to Lanaken to compete in the 7-year-old FEI World Breeding Championships in September. That is a long way away and all of the cards have to fall into place, but I am working toward that goal and I want to go there and be competitive. That is why I will continue to step up and down throughout the year to make sure I am prepared if I get to go because the jumps there will be BIG! The future is bright when I have Hank in it and I am so thankful to everyone that has made our journey possible this far. From Hyperion Stud who bred such a wonderful horse, to my mom and dad who helped me find him, and then have allowed and supported me in developing him, and who push me to be my best to achieve our dreams and goals. To my sister and the other individuals who have helped to train him and I along the way. To our barn staff who takes such good care of him and to all of our other team members who help him to compete at his best. Finally, to my grandfather his namesake, I am so lucky to have both “Hanks” in my life.